South Africa has a thriving wildlife (game) industry driven primarily by ecotourism and hunting. It therefore has a greater proportional land area cover dedicated to large game animals, and a higher density of game animals, than anywhere else. However, most of South Africa's game reserves are fenced and the larger animals cannot colonise new areas or migrate between them. Wildlife capture and translocation is therefore a common occurrence in South Africa with approximately 130,000 game animals captured and moved each year. An improved understanding of the physiological impact of capture stress will benefit the welfare and productivity of animals and the wildlife ranching industry in South Africa and beyond. I therefore worked with professional wildlife capture teams and professional hunters to collect data on the physiology of game animals under various capture and kill circumstances. Sampling was opportunistic; no animals were captured or killed for research purposes. To read more about the white rhinoceros, see photos and view photo slideshow and GoPro footage of rhino capture, de-horning and translocation, go to my Rhino! gallery. Wildlife ranching, or the management of wild animals for profit from kill, is one way in which to increase the cover and density of wild mammals on land that would otherwise likely be given to domestic livestock. Wildlife ranching is a growing industry in South Africa. Most game reserves are fenced. Where wild animals are fenced in areas with a lack of predators, there is a need to reduce a population that would otherwise expand until starvation or disease provided a check on population growth. Control of population is therefore a necessary result, as well as a goal (via harvesting), of game ranching. There are essentially two modes of free-living population control in the absence of natural predators; i) capture and translocation, and/or ii) cull (kill). Translocation can provide income to the owner of the stock. Cull can provide income via biltong (meat) or trophy. The expanding wildlife ranching industry in South Africa is driven ultimately by a demand for trophy and biltong animals, which fuels the wildlife translocation business. Each year in South Africa, approximately one million game animals are shot for biltong, 63,000 killed for trophy, with 130,000 animals translocated. There are therefore major welfare and productivity implications of capture and translocation. 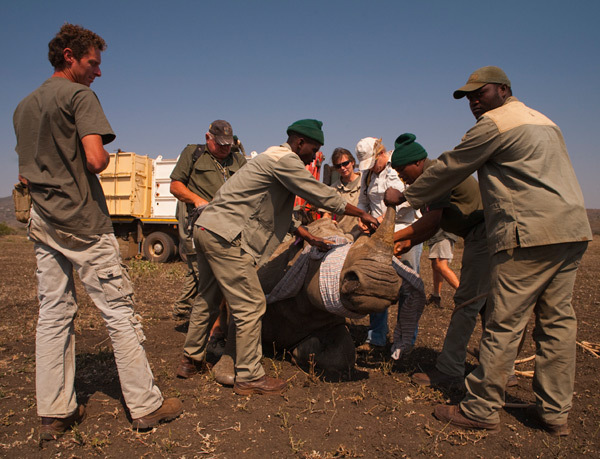 Over 50 wildlife capture and translocation teams operate in South Africa and elsewhere; principally moving ungulate mammals. However, this trade persists with limited scientific evaluation of the physiological stresses on the animals or how to minimise them. Physiological stress is known to compromise animal health, welfare, and consequently value. The benefits of this research therefore go beyond animal welfare, and importantly this provides additional motivation to wildlife managers and the industry to promote good practice that benefits animal welfare by reducing animal stress. This research evaluated physiological stress of South African game animals sampled post-capture or post-kill. Physiological parameters analysed include blood chemistry, salivary cortisol, and rectal temperature. Over one thousand animals were sampled across a variety of species with variable capture and cull circumstances. Data and results will be presented. The aim of this research is to evaluate the factors that influence physiological stress within captured and culled South African ungulates, and to subsequently make recommendations to the game industry to reduce the negative effects of stress on the animals.